Hi, my name is Kim and I'm addicted to crafting, cooking, kitchen gadgets and border collies. Thanks for stopping by! 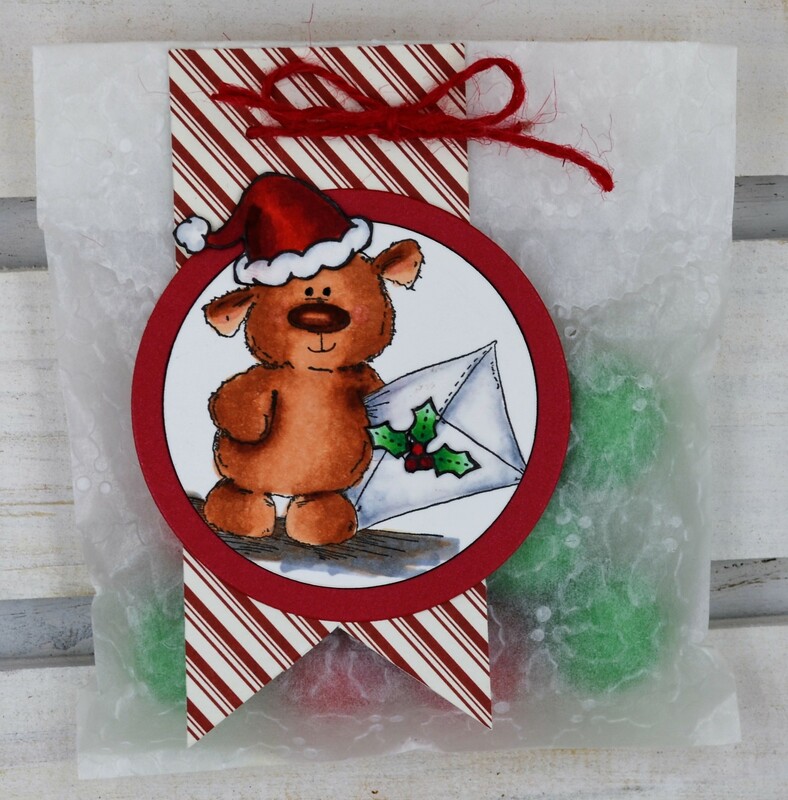 I love this little bear from Stamping Bella. His envelope actually has a heart on it, but I thought he would be perfect on this little package of Christmas goodies (they’re red and green yummy gumballs! ), so I covered the heart with some holly and berries. I colored him with Copic Markers and cut him out with a circle die. I cut the red circle one size bigger. The hat he’s wearing is from the Lawn Fawn Hats Off to You set (there’s a hat for almost every occasion). The holly and berries are from the Lawn Fawn Joy to the Woods set. I added a little smile with a Copic fine line marker, and the string is red jute. a glassine bag that I am embossed using a holly and berries embossing folder. I’ve also embossed kraft paper bags and bags I made with vellum with various embossing folders and they turn out just darling. I’ll show some of those later this month. The patterned paper is from a Simple Stories Christmas 6 x 6 paper stack. This entry was posted in Cardmaking, Crafts, Uncategorized by Kim. Bookmark the permalink.